The official illoz mousepads designed by Mr. Gary Taxali are on the docks and ready for first shipment tomorrow! These have been a long time coming, but I assure you they are worth the wait! These fine and highly collectible items are available only to art directors with registered accounts at illoz. 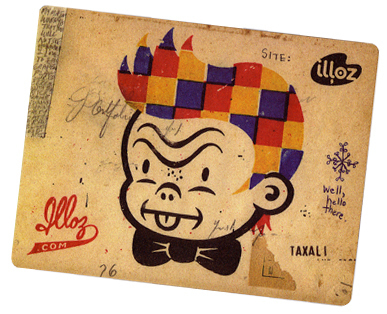 So, if you are reading this and suddenly look down and realize, "Hey I'm an art director without an account at illoz"... then what the heck are you waiting for? Get an account right here and get a mousepad. There are plenty to go around! As an added bonus, art directors also get the Official Art Director Owner's Manual, which is a handy booklet, capable of guiding any art director through the best use of the illoz system. As you may know, illoz is a lot more than a pretty portfolio site, folks. 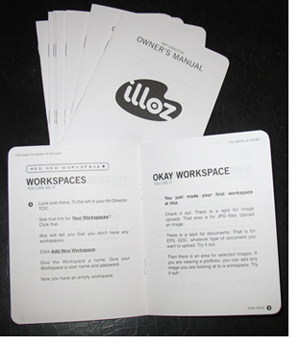 Indeed, it's filled with lots of handy tools for getting jobs done and this invaluable illoz Owner's Manual will make all these fancy gizmos easy to understand and start using right away. Hey what is this place? A mail room? 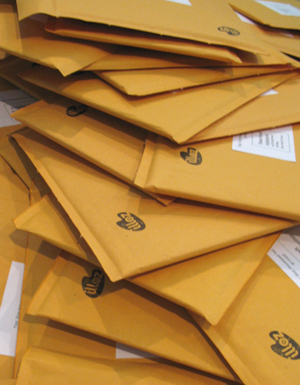 Envelopes are everywhere! Get this stuff outta here! I wish I was an art director so I could get this swell mouse pad! Looks like a real business. I too Rob! Congratulations Mr.Zimmerman for your hard work!